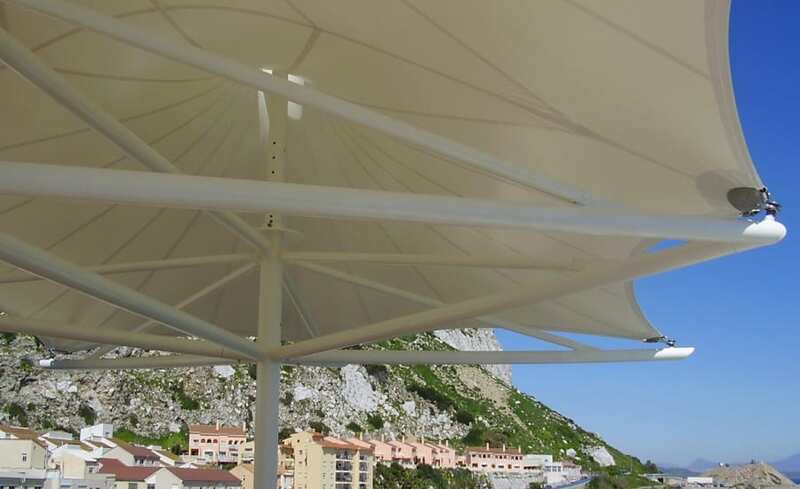 Owners of the Caleta Hotel in Gibraltar approached Architen Landrell to design, manufacture and install a twin conical tensioned fabric canopy to provide shade in the strong summer sunshine. The shade structure was intended to provide an exclusive enclosed terrace area where guests can relax, sunbathe and enjoy the stunning architecture and views. The Caleta Hotel, built on the sub-tropical island of Gibraltar, is an exclusive luxury hotel where guests go to unwind from the stresses and strains of everyday life. 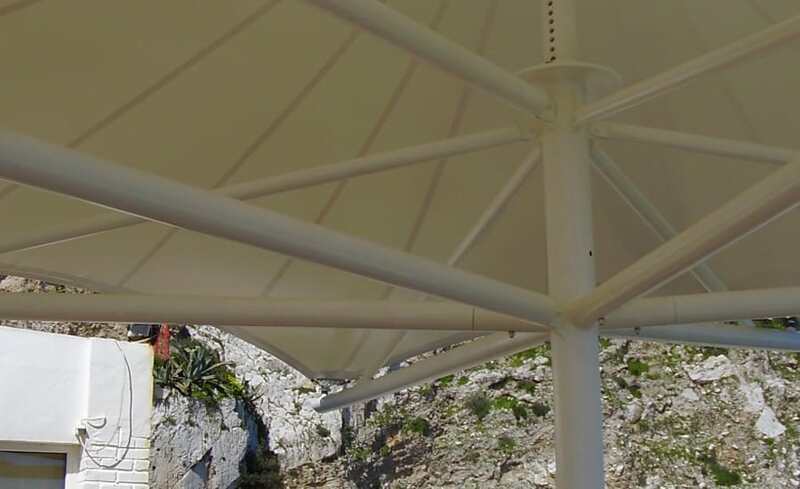 Unsurprisingly, therefore, the owners of the hotel chose to install a sharp and crisp white twin conical canopy to shade the terrace and protect their guests. 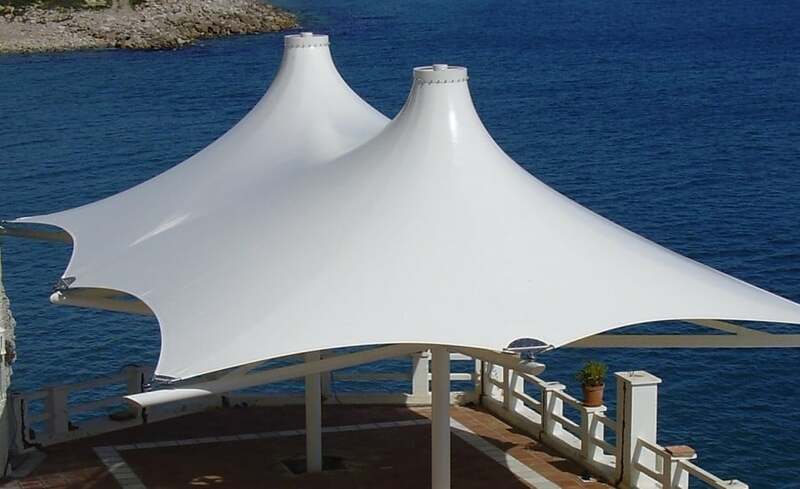 For Architen Landrell the design posed no problems, being a simple twin coned fabric membrane in PVC coated polyester. However, no project is entirely straightforward and the Caleta Hotel was no exception. The difficulty was in the fact that the terrace on which the canopy was to be placed, could only be accessed through the Hotel. This left no room for craning the steelwork in, so the challenge was then to design everything to be carried by hand. The fabric structure was erected by hand and the time-consuming and painstaking work was completed by the site crew at Architen Landrell. The result, however, is remarkable. The white twin peaks contrast elegantly with the blue azure sea and the tropical palm trees, and provide a shady place where hotel guests can admire the stunning panoramic views.